Hi! How are you? Today I am sharing a really easy breakfast recipe with you. My kids love it and it takes me just minutes to prepare. Most of the time, I dish out the scrambled eggs with toast soldiers but occasionally, I might add a couple of sausages or bacon or blanched asparagus which is my favourite pairing. The trick to making it extra special is a special ingredient that I use in my scrambled eggs. I found it one day when googling for the "best scrambled egg recipe" in the world. And up popped, Gordon Ramsey's recipe. Most people add a dash of milk to their eggs when scrambling them. I know, it sounds strange but it is heavenly. It somehow makes it creamier and adds that extra zing. I use light sour cream cos it is easier to find in supermarkets in Singapore. You should try it cos I only ever cook scrambled eggs now when I have sour cream in my fridge. You don't need a lot, approximately 1-2 tablespoons to 6 eggs. Meanwhile, toast the bread. Snip into 4 lengths to look like toast soldiers. Season the eggs at the last minute, then garnish with dill. 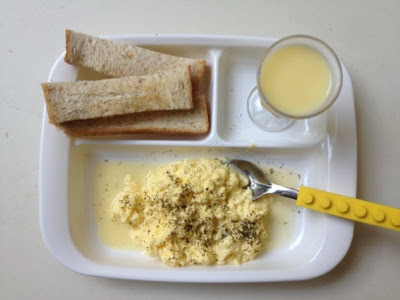 Arrange the the toast soldiers and softly scrambled eggs on the plate and serve immediately. which features breakfast ideas from 14 Singapore Mom Bloggers. Click on the badge for more breakfast ideas!